The convoy enroute to Desaru. THE Vios is no stranger to Malaysia, and has been a familiar sight on our roads since the first model was introduced back in 2003. A sedan designed primarily for emerging markets, the Vios was a step below the Altis and two steps below the Camry, and was developed through a collaboration between Japanese and Thai engineers. Assembled in Toyota Gateway Plant in Chachoengsao, Thailand, from the start, the Vios was a clever bit of packaging from Toyota. Leveraging Toyota’s worldwide reputation of reliability, the carmaker made a cheaper car for developing countries. Something that the lower-income earners in the region could lap up. When first introduced in the Malaysian market, its direct competitors included the Nissan Latio, while in the national sector, in terms of displacement, it was just slightly below the Proton Persona. Over a 10-year period between 2003 and 2013, more than a million Vios were sold in the region. Malaysia was also one of the largest markets for the Vios. In 2004, Toyota sold more than 17,000 Vios in Malaysia. By 2007, UMW Toyota Motor Sdn Bhd embarked on an even more competitive pricing strategy, with the Model J priced close to RM70,000. By 2013, some 30,000 were flying out of the showrooms each year. Since it was introduced in Malaysia, about half a million have been sold. The new Vios is priced from RM77,200. This was when the industry was more restricted. Brisk sales of the Vios put a dent in the annual figures of other carmakers, including Proton. Now Toyota wants to bring back the glory days with its latest Vios. This new car, in the words of UMW Toyota Motor president Ravindran K, would “change Toyota and bring it back to the glory days”. UMW Toyota Motor recently launched the all-new Toyota Vios with a starting price of RM77,200, excluding insurance. Three variants are available: the 1.5J, the 1.5E and 1.5G. As before, the J model is the base model. Priced at RM77,200, it is a few thousand ringgit cheaper than the 1.5E, which retails at RM81,200. Further up the totem pole is the 1.5G which is priced at RM87,300 (excluding insurance and private individual registration only). All variants are powered by a 1.5-litre four-cylinder, 16-valves DOHC with Dual VVT-i engine mated to a CVT 7-speed with sequential shift. It is the same mill that has been moving the Vios since 2016 and produces 105hp at 6,000rpm and 140Nm of torque at 4,200rpm. The third generation all-new Toyota Vios is the first model to roll out from UMW Toyota Motor’s new manufacturing plant at Kawasan Perindustrian Bukit Raja, Klang, Selangor. Standard features available across three variants include LED daytime running lights, headlamps with follow me home features, automatic air-conditioning system, sport and eco mode, smart entry with push start button, rear flat floor, rear USB ports, full size spare tyre and alarm system with cabin sensor and tilt sensor. The 1.5E and 1.5G are equipped with LED rear combi lamp, 6.8-inch DVD-AVX with USB mirroring, panoramic view monitor, front digital video recorder, vibration control front side glass, acoustic windshield, rear 60:40 split seats, and the auto folding side mirrors. 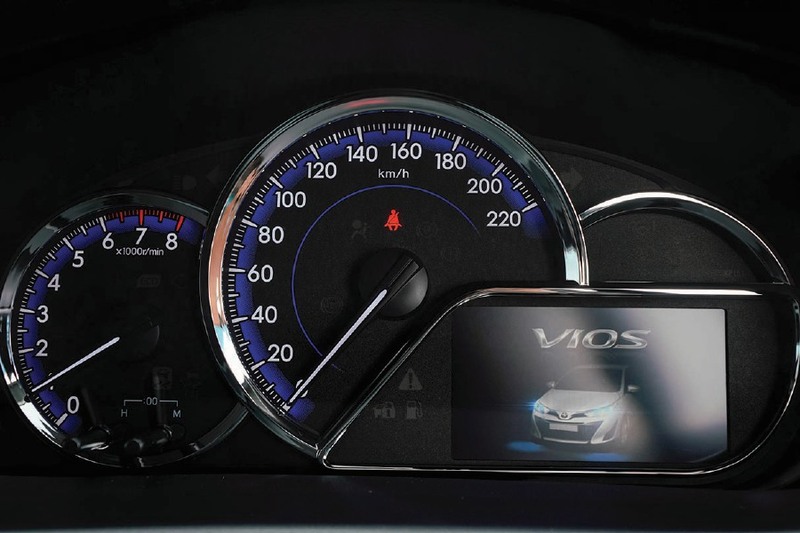 Instrument cluster in the new Vios. On the top range 1.5G, there are 16-inch alloy wheels, leather seats and trims, 4.2-inch Optitron MID with TFT, paddle shifters, EC mirror, steering switch for audio, MID and Bluetooth, and rear disc brakes on top of the standard features. 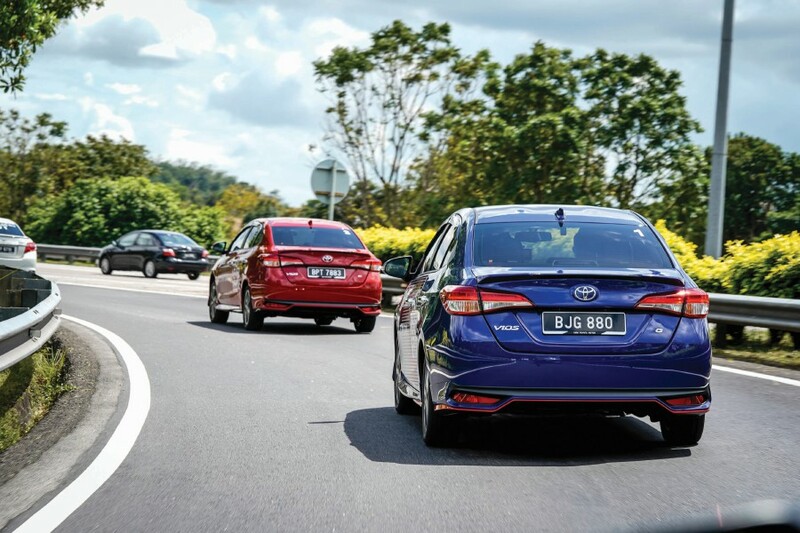 Safety is satisfactory on the new Vios with all variants having achieved five-star ASEAN NCAP rating. Standard features across the range are seven SRS airbags, vehicle stability control, traction control, hill-start assist control, anti-lock braking system, electronic brake distribution, brake assist, speed auto door lock, rear fog lamps and ISOFIX child seat mounting points. The 1.5E and 1.5G are equipped with blind spot monitoring with rear cross traffic alert system. 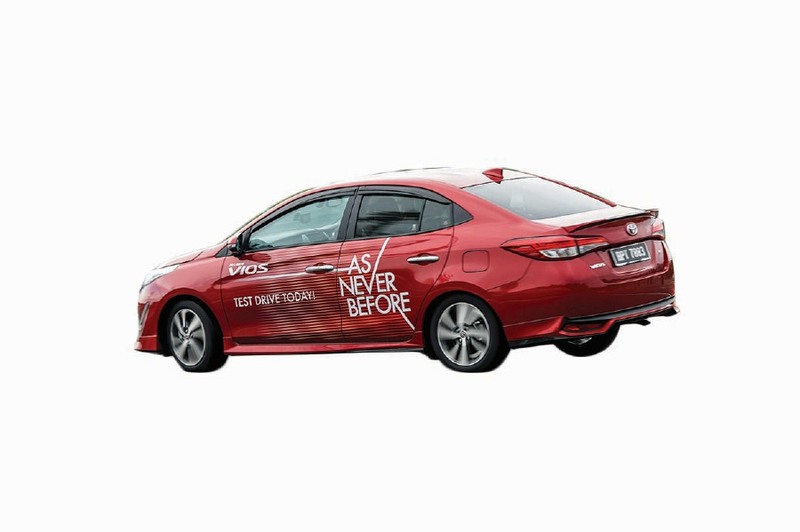 The Vios comes in five colours — Dark Blue Metallic, Red Mica Metallic, Attitude Black, Silver Metallic and Super White II — and covered by a five-year unlimited mileage warranty, and a free 24SEVEN road assist membership for the first year. The Vios has improved in increments since it was first introduced in 2003. 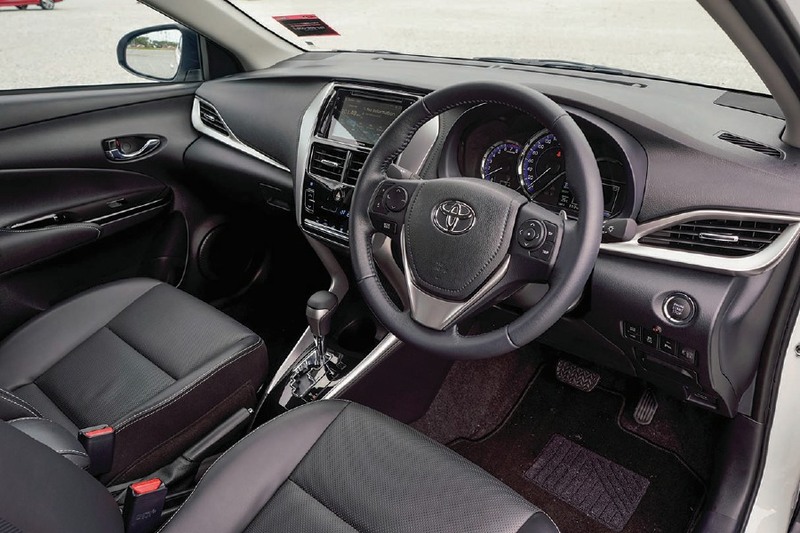 The current model has refined the formula for the entry level sedan, but at its core the new Vios is still the sedan most Malaysians are familiar with. We drove from Toyota’s HQ in Shah Alam all the way to Desaru, on mostly highways. On the highway, its 1.5 litre powerplant is sufficient to drive the relatively small car at a decent pace. With simulated ratios, the gearbox mimics a seven speed box. The CVT gearbox settles into a relatively low RPM once on the highway, hovering at slightly over 1,500rpm. At higher speeds, and on acceleration it does drone a bit, but while driving within the national speed limit, the car is quiet courtesy of the well sorted drivetrain and good insulation. The suspension is set up for comfort, and as such leaves the Vios feeling a bit floaty on the highway. The steering is not the sharpest either, and this car is unlikely to fall in anyone’s books as a “driver’s car”. NVH levels in the car though have improved tremendously over the previous generations. Sitting inside the car, there is also no doubt that fit and finish have similarly improved. The instrument cluster is now quite fancy — seats are comfortable — and while it is still a B-segment car, the interior is spacious, with acceptable legroom and elbow room for both driver and passengers. 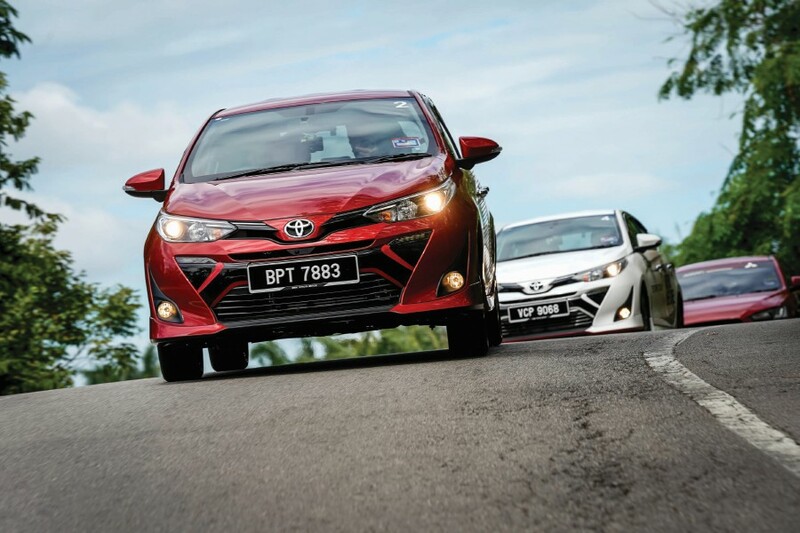 The Vios now offers much more value for ringgit. From features to safety, Toyota has brought the Vios up to date. However, while the car has moved forward, the Malaysian automotive landscape has also changed tremendously, and this may be a bigger determinant of whether Toyota will be able to bring back their glory days with this new sedan.